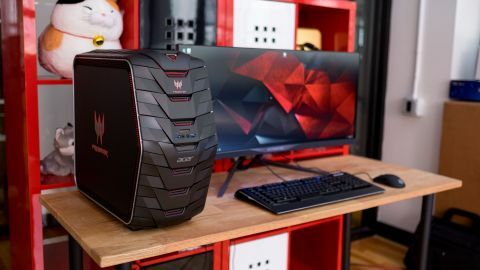 Gaming desktops have a history of being hulking, over-the-top computer boxes, and the Acer Predator G6 takes this trend to a whole new level. This larger-than-average mid-tower packs a ton of neat, hidden features. However, with room for only one graphics card and a cramped interior, it lacks the expandability and accessibility of competing machines, like the Lenovo Ideacentre Y900. The Acer Predator G6 bears a striking and unique style that looks like a giant tank tread or a retired monster truck tire. Alternatively, the case resembles an alien pod from another dimension, given all the chevron-shaped fins make it look like something out of the Stargate universe. From the side, the Predator G6 looks like a giant black and silver square with one pointed angle jutting out in front. The rear of the case takes on a snake head-like appearance with its maw open to reveal backside ports. The top rear edge also acts as a carry handle, which you'll feel especially thankful for when you're trying to move around this 34-pound beast. While, the Predator G6's overall design is certainly eye catching, a closer look at the details shows subtle use of a few red accents and LEDs on its otherwise jet-black exterior. The only light-up portions of the case include the nabla-style power button underlined by a small glowing line. Then, along the sides, you'll find a perforated strip that only switches on when you kick this PC into a turbocharged, overclocking mode. The real genius of this case reveals itself when you start unlocking and flipping out its many panels. The chevron-shaped fins don't just look cool, the two top-most panels open to reveal a hidden optical drive. Just below that, another fin flips down to give you access to a hot-swap hard drive bay. What's more, below the front I/O ports is a pop-out tray from which you can hang your headset. If you're a gamer who's constantly at a loss for where to put their headset, your search is over. Of course, what really matters is what a gaming desktop is packing in terms of power, and the Predator G6 comes fully loaded. This $1,999 or £1999 (about AU$2,616) setup you see above comes decked with the highest-end Intel Skylake processor available today, paired with a heavy duty Nvidia graphics card. The 256GB solid-state drive is par for the course with other gaming desktops, but the 16GB of memory and 2TB spinning drive seem almost excessive. That said, the beefier power supply is a welcome addition and will prove useful when upgrading to something more demanding, like the AMD R9 Fury or Nvidia GTX 980 Ti. Still that is a hefty asking price, and DIY builders could easily put together a machine with the same specs for far less. Acer's lower-end $1,499 or £1,499 (about AU$1,962) configuration for the Predator G6 – with an Nvidia GTX 970 and half the amount of storage – is easier to swallow for its price. Unfortunately, upgradability isn't one of the Predator G6's strong points. Pulling off the inch-thick side panel reveals a much smaller interior that's closer to a Micro ATX-style case surrounded by a plastic fairing that basically makes the PC much larger than it is. Worse yet, a mess of cables dangling from the top of the case makes the space inside even tighter and a bigger pain to maneuver around. You'll also have to contend with a lot of screws, as the only tool-less installation you will perform on this desktop is swapping out the RAM. And just aesthetically, the unpainted, bare metal interior is a big disappointment considering the PC's heady price tag. Thanks to packing an Nvidia GTX 980, the Predator G6 is the best-performing pre-built PC we've tested yet. It offers a much smoother experience while playing GTA V at 52 frames per second (fps) versus 44 fps as seen on the Y900. Strangely, the Acer PC performed worse on processor-centric tests, like PCMark 8 and Cinebench. However, this is something you can easily remedy by hitting the Turbo button, which overclocks the processor to its turbo-boosted speed of 4.2GHz. For the most part, the CPU is plenty fast at its base clock speed, but the extra performance boost comes in handy for physics and AI-driven games, like Starcraft 2 and Skyline Cities. For 2,000 clams, the Predator G6 is almost all all show and not much substance. I laud the case for its stunning yet reserved aesthetic, and its smart use of flip-out panels to conceal handy features. However, Acer could have easily made better use of the space inside for more airflow, better cable management and space for upgrades. The Acer Predator G6 is a sharp-looking and performing PC for users who simply want a PC that works without having to dig into it. But, once you get past the façade, this desktop is just hollow on the inside.